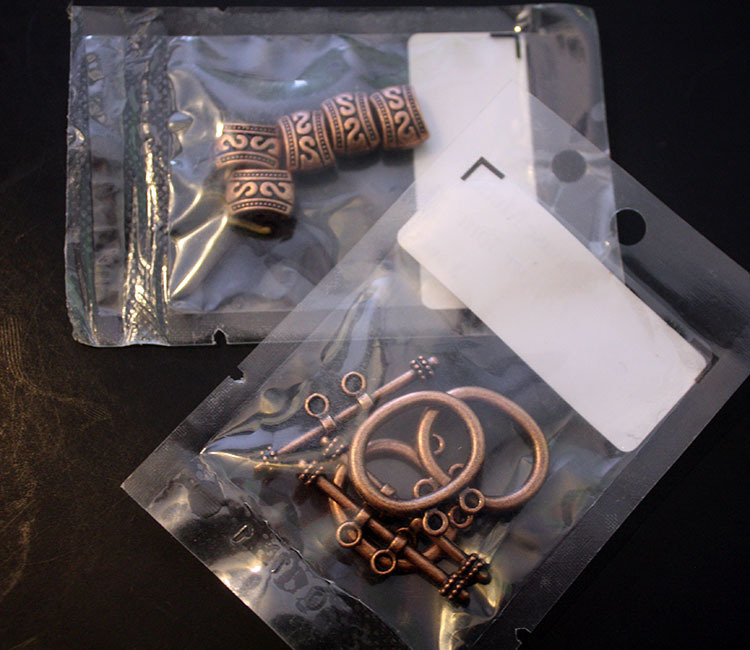 Last week, I teased you with a picture of a baggie of goodies I received from ZnetShows. Today I want to reveal what was in that baggie and what I did with those goodies. First let me say how this all started. I was contacted by Bill at ZnetShows asking if I would be interested in being part of their design team for the Tuscon show. Basically, that meant that I would accept some of their Cultured Sea Glass Bead samples, make a few designs, and receive a gift card to their shop in return. It sounded like a win-win situation to me so I accepted readily. Here are the glass beads I received. 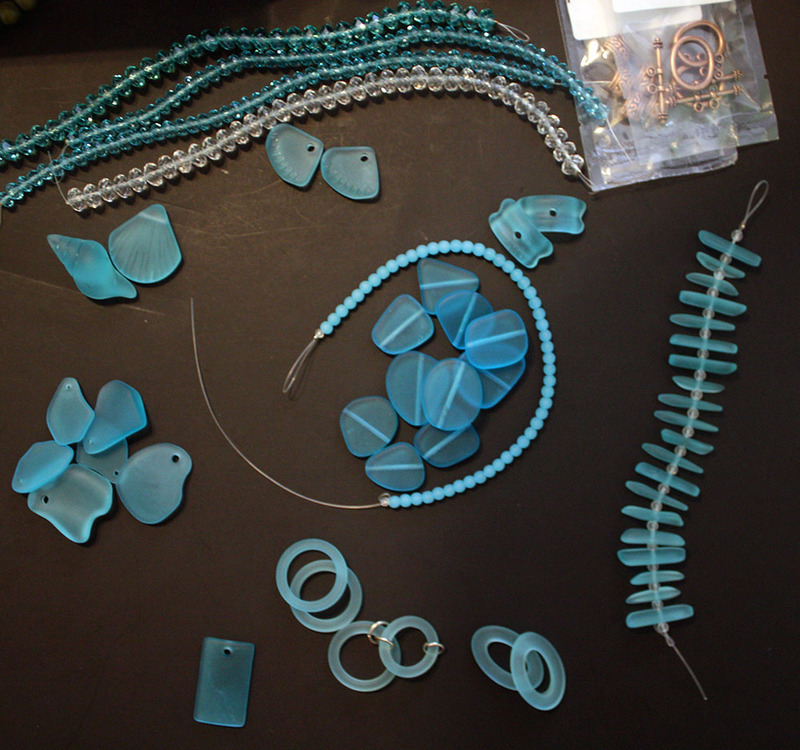 Here's another shot of the beads and findings as I grouped them. That's a whole lotta loot! 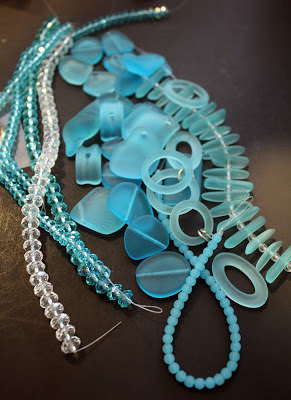 The flat freeform sea glass beads called out to me first. I guess with it being sea glass I was longing to create a beach inspired piece. 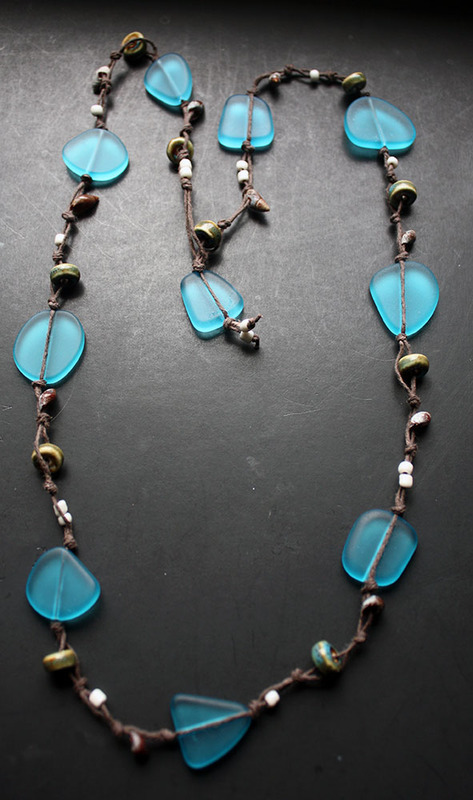 With just some brown waxed linen cord, some off-white e-beads, ceramic discs, holed shells, and the sea glass this long-ish necklace came into being. After that, I went into some kind of creative frenzy and am not sure what came into being next. I had just received those copper-colored wood beads in a giveaway and thought they complimented the tuquoisey blue of the sea glass well. 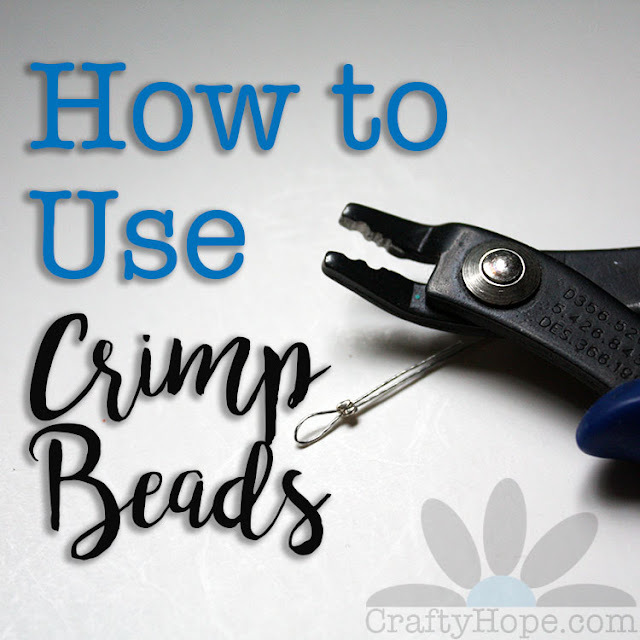 With some of the faceted glass beads, they fit into the center of the oval rings perfectly. I was working on another design for a bracelet, when this one just fell together. The other one never did come into fruition. I love that the textured silver rings fit on the sea glass rings perfectly. This bracelet just SHINES to me. I started playing with some of the free form pendants and they sort of just arranged themselves in a pattern. I think they knew what they were doing. My favorite design was created somewhere in the jumble of all the others. I know we're not supposed to have favorites when it comes to our 'babies' but I just can't help it with this one. She's a beauty isn't she? I made the focal with the single rectangular pendant in my mix and a scrapbooking rub-on. To ensure it stays where it's supposed to be, some matte mod podge was applied to it. Of course, that's all the backside of it. 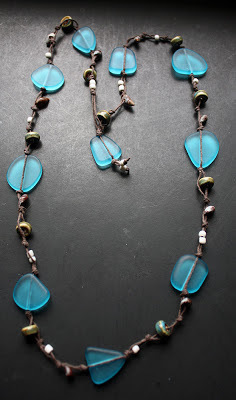 From there, seed beads and sea glass sticks were wrapped and wired onto Vintaj arte metal wire. 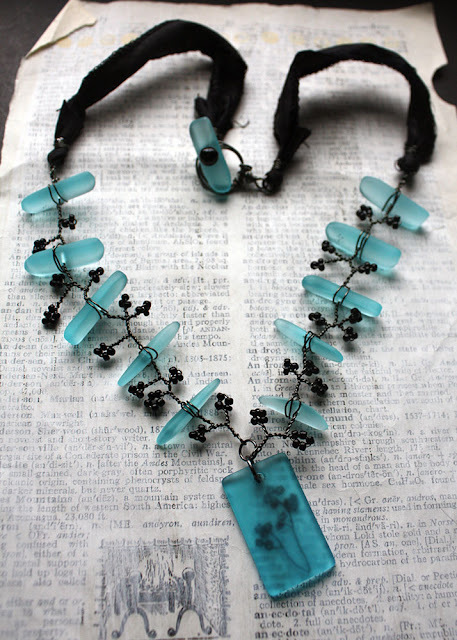 Some black silk ribbon finishes up the back of the necklace while another sea glass stick, glass head pin, and wire-formed toggle close the necklace. Now I wait to see if any of my pieces have been chosen to go to Tuscon. If they have, I'll be sending my baby(-ies) away for a little while. I really enjoyed working with the sea glass. There were so many shapes and sizes from which to choose and the color selection of these cultured sea glass beads is pretty awesome. I've already seen some of the designs the other members of the team have come up with on the ZnetShows Facebook page and am blown away by them. Here's a list of the other artists chosen for the design team and their reveals. As well, you can click over to ZnetShows' blog for some sample shots. Thanks to Bill and whoever else is involved over at ZnetShows for selecting me to participate in this design team. It's been a lot of fun. Lucky girl! I would have loved to have been on that team. I have some of their glass and it's really beautiful. I really like your copper earrings with the wire! Love, love, love what you created. It's ok if I have a favorite, isn't it? I do love the last one, but, really, all the designs are wonderful. I really like the earrings, with the copper wood bead - very creative. And the nuggets that arranged themselves? Don't give those nuggets all the credit! Ooh, those earrings are brilliant! Love, love, love! Your goodie bag totally rocked! Gorgeous earrings ~ and love the top and bottom necklaces. and the middle one. and the bracelet. The folks as Znet knew what they were doing when they invited you to join their team. ALL your designs are fantastic. Truly amazing pieces. I'm totally in love with the bracelet! Backstory- You are way too kind!! Have you seen some of the other designs? They are amazing. 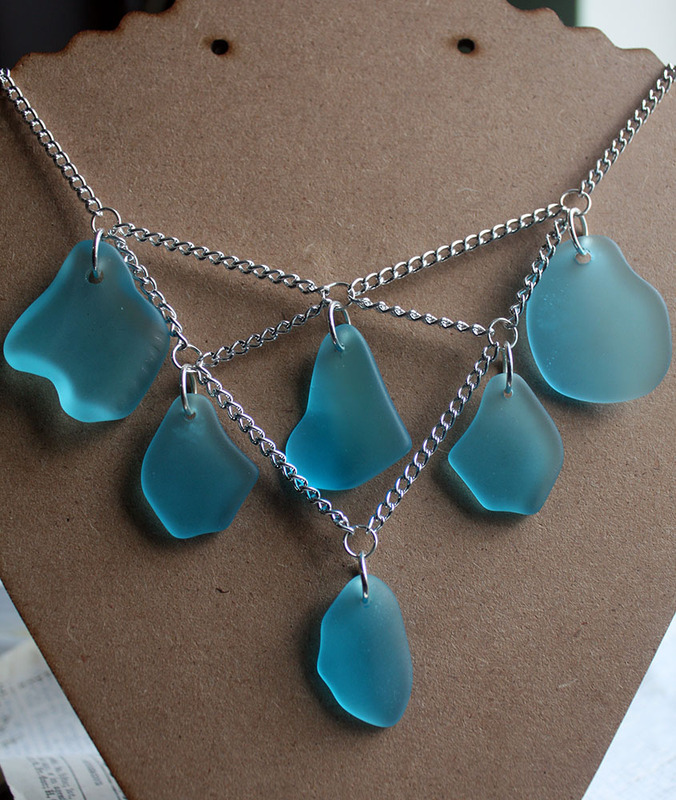 I had no idea how elegant sea glass could be. Thank you though for very sweet comment. It means so much to me. Beautiful! I can't decide which piece is my favorite as they are all very pretty. Beautiful color. Wonderful designs. My favs are the twisted wire and the necklace with the textured rings. Lovely pieces, Hope! I really like your last "baby" - that necklace is amazing! Good luck!! lovely pieces, I love the flowery one, so awsome the way you tied it in with the focal. Good luck! You wraps on the stick necklace are just incredible! What a great design. Very pretty, Love the wire wrap it really looks great with the sea glass. Your wire wrapping is gorgeous! 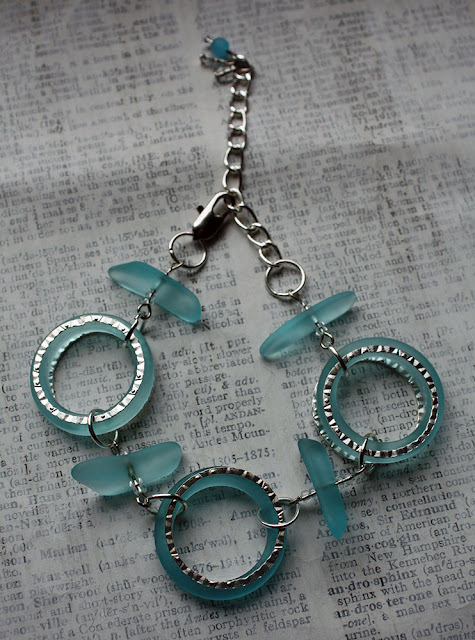 And I love the way you stacked the silver rings on the sea glass...it's absolutely lovely! That last necklace is gorgeous. 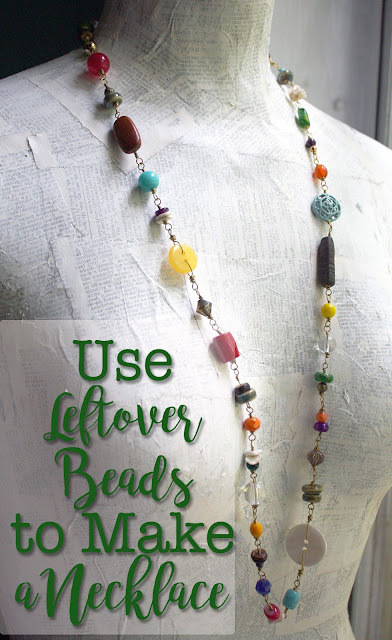 I love the image transfer idea and more so I love how you made the necklace revolve around it! Charlie- I'm so pleased you like the rub-on idea. It worked out pretty good. It was fate that I had a rub-on that went with a technique I could accomplish. Thank you! Those earrings are fabu! Great job. 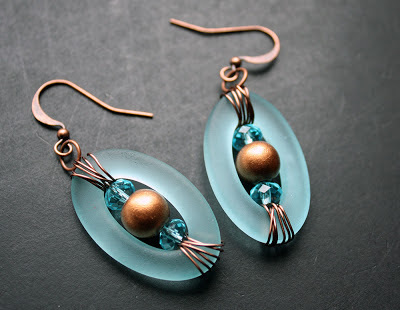 Oh, your designs are gorgeous - especially the wire wrapped one - yes, it's a winner. I'm realy loving the hand-knotted one though - it's so beachy and cool looking with all it's texture! Congrats on the team, hope one yours gets selected!! You made some great designs. I really like the way you wire-wrapped those ovals in the earrings and that bracelet is so cute. But they're all great pieces. I only had time to make 4 designs with my samples, but had a lot of fun with them.